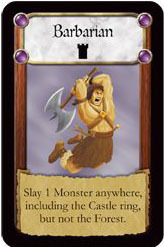 This savage warrior can slay any Monster anywhere on the board (including the Castle ring) except the Forest. This card enhances any regular hit card. Play this card with any card that hits a Monster, and that Monster is slayed. This card temporarily stops a Monster in its tracks. 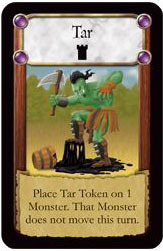 Play this card and place the Tar token on any 1 Monster anywhere on the board, including the Forest or the Castle ring. That monster does not move during the Move Monsters phase nor during the Draw 2 new Monsters phase of the turn. Even if a new Monster token would cause the Monster to move, it remains where it is. 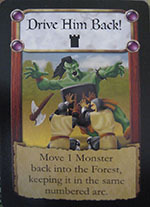 On the next player's turn, the Tar token is removed and the Monster is hit, slain, or moved as usual. This card reinforces one Wall to make it stronger. Play this card and place a Fortify token on any 1 Wall. 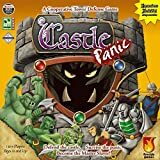 When a Monster attacks that Wall, the Monster is damaged for 1 point as usual, but the Fortify token is removed instead of the Wall. The Monster stays in the Swordsman ring. 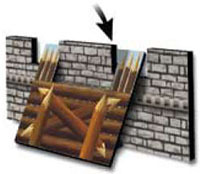 If a Giant Boulder hits a Wall that has a Fortify token placed on it, the Giant Boulder stops, the Fortify token is removed, and the Wall remains in play. Play this card and move 1 Monster all the way back into the Forest, keeping it in the same numbered arc. Play this card to avoid drawing any Monsters during the Draw 2 new Monsters phase of the turn. 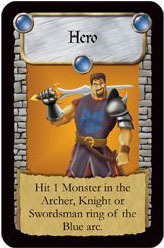 In the Overlord version of the game, this card prevents the Overlord from drawing or playing any Monster tokens. Play this card to add 2 cards to your hand, even if it exceeds the normal hand size. 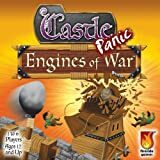 These cards may be played during the Play Cards phase of the turn in which they were drawn. Play this card and search through the discard pile for any 1 card. Add that card to your hand. That card may be played during the Play Cards phase of the turn in which it was drawn.